This Bits and Pieces post is about mixers. There is nothing inherently new or exciting in my system, which isn’t complete yet, but it’s building up to something more interesting in the latter stages. First of all I started with a small 4-channel mono in-mono out Soundlab Micromixer for £6 or £7 on eBay. Fortunately, this came with a circuit diagram, so it was easy to add 4 more identical input channels. These are housed in the ‘Red Dragon’, a Stylophone case from which the innards had been removed (for use, I think, in The Gemini, which is two Stylophone circuits in one body). The Red Dragon feeds the Micromixer with 9v power as well as the 4 extra input channels (the ones with red caps). But I like working in stereo, so the 4 extra inputs are switchable from mono to stereo: the stereo side of the switch sends the input via a passive mixer (a 10k resistor on each channel) into the input of a pseudo-stereo circuit, and from there to a stereo output socket. 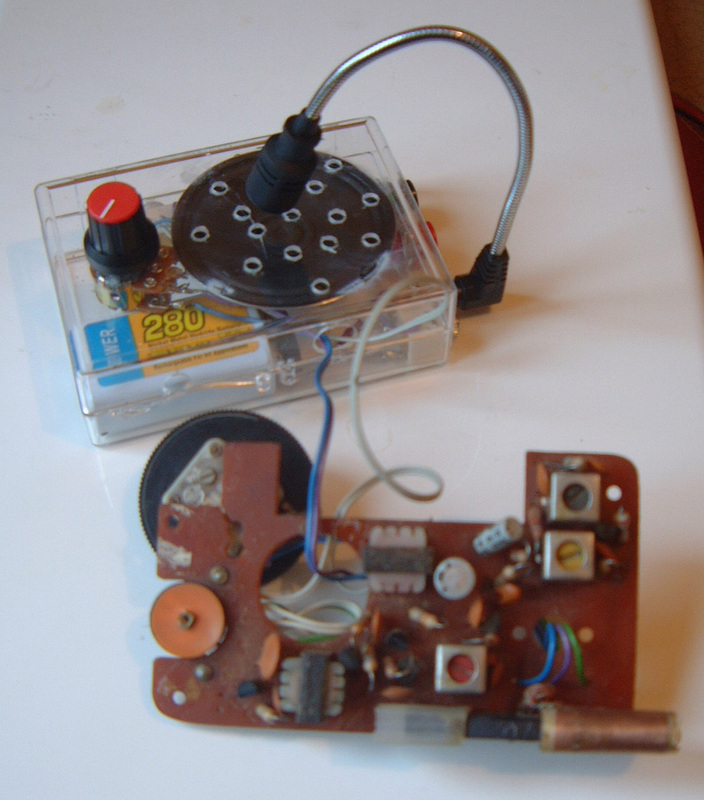 I’ve lost the circuit diagram and explanation of the pseudo-stereo circuit, but it was published in an electronics magazine in the 1980’s, and I bought and made up a kit version from them. It may even have been the work of the amazingly prolific RA Penfold. At the time I used it to listen to mono cassette tapes on my Walkman, and it improved them no end. An empty cassette box was just big enough for the circuit board, headphone socket and PP3 battery; it was still in this box when I recently found it, and needed only a replacement 741 op-amp, which had evidently been scavenged at some point in the past. 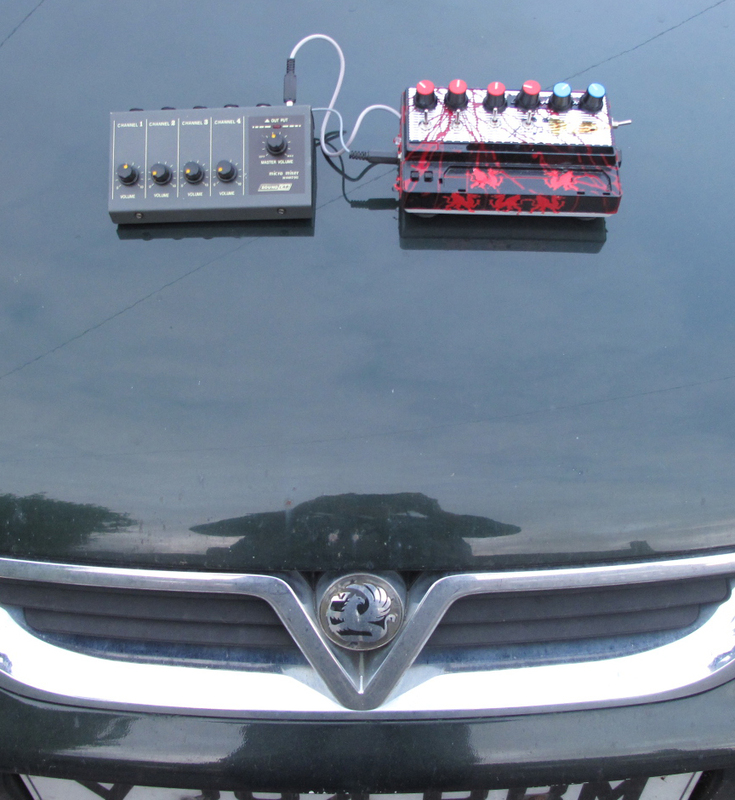 I don’t remember precisely how it works, but it seems to be some sort of frequency-dependent phase-shifter, whereby some frequencies are sent to the left ear, some to the right, spreading a single mono signal throughout the stereo field: perfect for sounds with a rich harmonic content – like the Stylophone, for example. (Mono instruments The Alien and The Hedgehog are ideal candidates for this treatment). Which one of the channels is ‘left’ and which is ‘right’ using this system seemed entirely arbitrary to me, so I added a switch to reverse the output channels, according to taste. 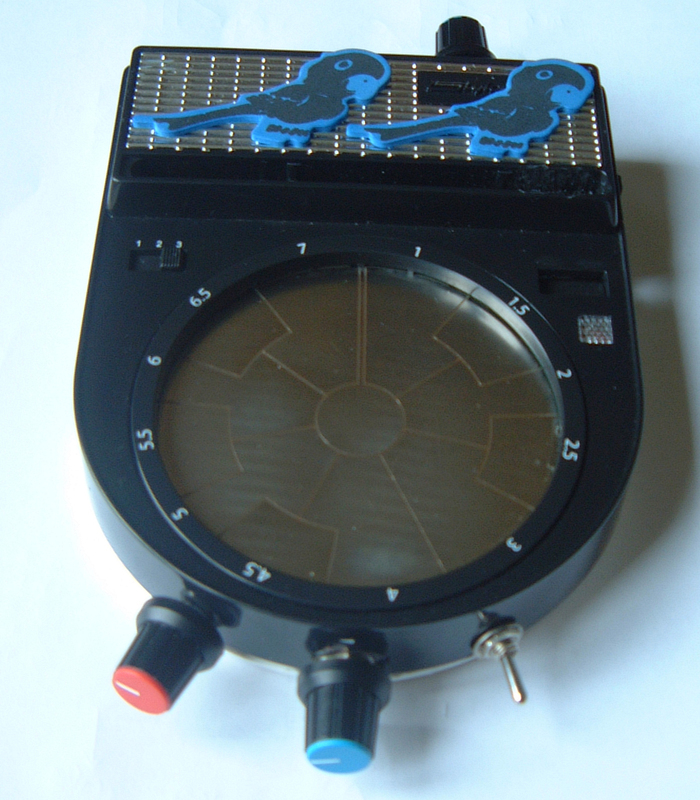 In fact, there was room for two more input channel pots on the top of the Stylophone case, but no room for the switches and circuitry beneath, so these two channels (the ones with blue caps) go directly into the passive mixer and pseudo-stereo. While the stereo signal currently goes directly to a stereo in-stereo out mixer, the mono output goes to a 6-channel mono in-stereo out mixer (a Realistic 32-1210, £10 off eBay) . This has a balance control on each channel, so the intention is that the section described here will be the centre channel, and there will be further sub-sections for left and right parts of the stereo field. Later posts will indicate how this works out. The stereo in-stereo out mixer (£6 off eBay) is a Hama SM502. Although the inputs of this mixer are marked ‘Microphone’, ‘Magnetic/Ceramic cartridge’, ‘Phono’ and ‘Tape’ (i.e. it’s a mixer intended for a domestic hi-fi!) experiments have shown that they work fine with the signal levels involved here. These are not highly significant, but I’ve spent time making and using them, so I thought I might as well briefly describe them. First of all, as you can see, the aesthetic involved is a different one from the projects I’ve described before. By and large, they’re designed for mono use – although the headphone amp, based on a TDA2822 chip, is for connection to conventional stereo headphones – and they have a deliberately ‘retro’ appearance to emphasise the simplicity of the lo-fi circuitry and sounds they’re used for. 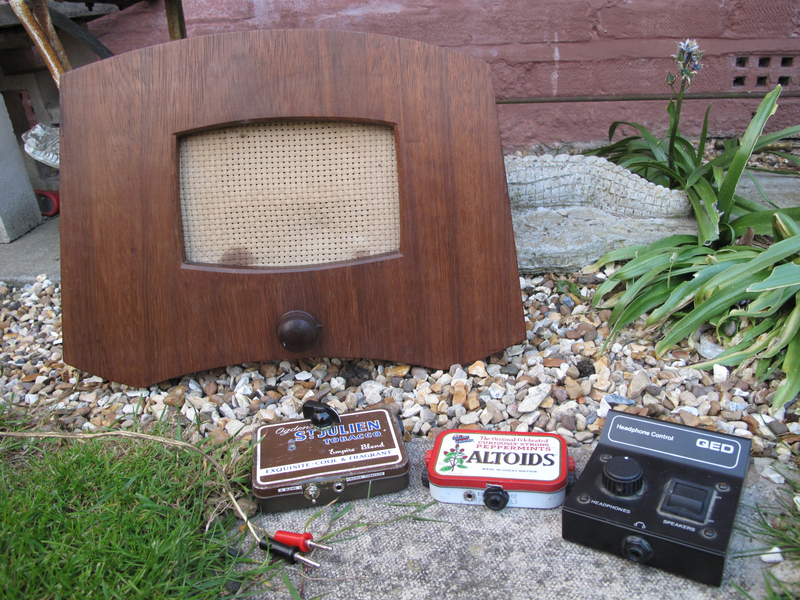 The circuits are housed in old tobacco and sweet tins I found in my garage: they came originally from my Grandad’s shed, so are very likely older than the speaker. 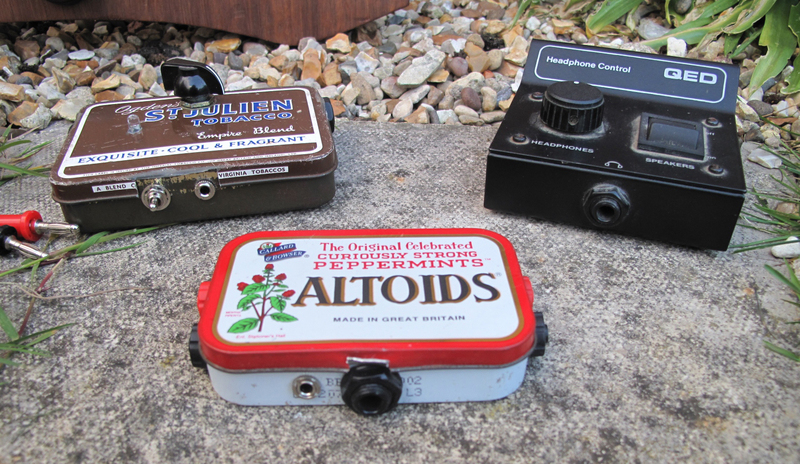 (Except possibly the Altoids tin, which strikes me as being somewhat more modern, although I haven’t looked into it). 1. The speaker enclosure – I use the word ‘enclosure’ loosely here as in fact it has no back to it – is something I saw around the house as far back as I can remember: the late 50’s/early 60’s. I think my Dad made it: I must ask him. Somehow I seem to have inherited it; and all I’ve done to it is to replace the speaker itself, which had got damaged over the years, with a new one, which is full-range and 8 ohms impedence; and exchange the connectors on the end of the lead with 4mm banana plugs. The main use of the extension speaker is to get a better sound from instruments with no line out. To date I have two of these: the Cracklephone and the Touch-Radio. Both of these have 4mm banana sockets on them, and the speaker leads terminate in banana plugs, so can be connected directly into these instruments. 2. 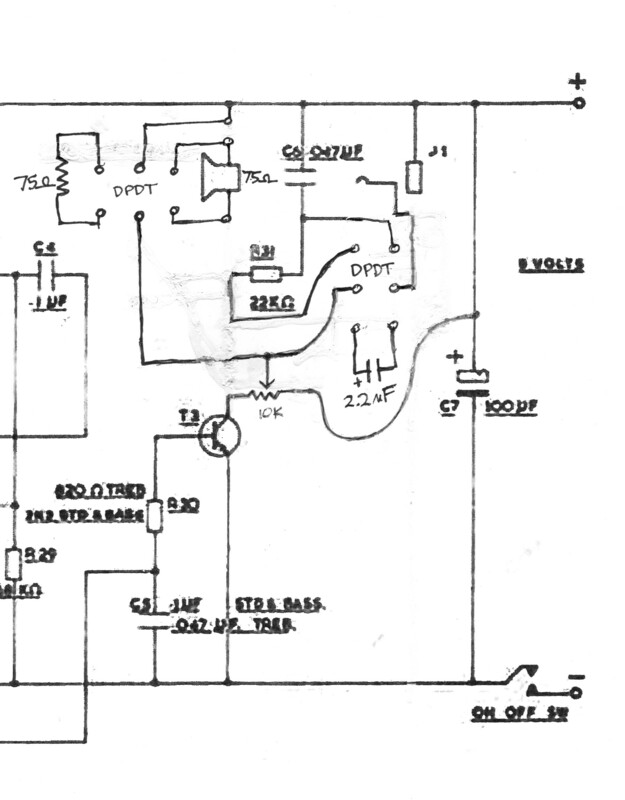 The headphone amp I made some years ago, from a circuit diagram I now appear to have lost. 3. The headphone/speaker switch was also found in my garage – possibly a car-boot acquisition: designed for stereo headphones, but used in this set-up only for mono signals, divided and fed to left and right.To avoid antagonising my neighbours too much, especially late at night, I have a pair of banana leads to connect the instruments to the headphone/speaker switch, via the sockets in the Altoids tin, which allows the headphones to be used in place of the speakers. I didn’t manage to show this in the photo, but the speaker leads from the instrument or amp are connected to the banana sockets on the left of the Altoids tin, the headphone/speaker switch connects via the small stereo socket (in) and large mono socket (out) on the front, and the speaker connects to the banana sockets on the right. 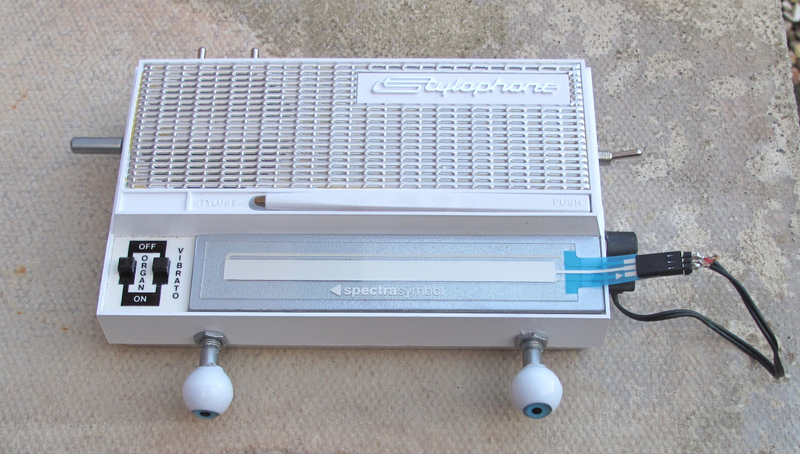 The older Stylophones in my collection would benefit from the addition of speaker sockets: as referred to elsewhere in the blog, most models seem to have additional components in the line-out circuit (filtering out higher frequencies), which gives the line-out sound a different character compared to the tone from the internal speaker. Much has been written on the Cracklebox, and how it is against the principle of the original design to add a line-out. As I see it, it isn’t a violation of principle to use an external speaker in place of the one built in to the instrument itself: a wider range of volume and tone is available this way. And that’s what these Bits & Pieces are about, I suppose: creating sounds in a live, old-fashioned, organic sort of way, in contrast to the modern, synthetic, digital way (also good, of course – just different!). 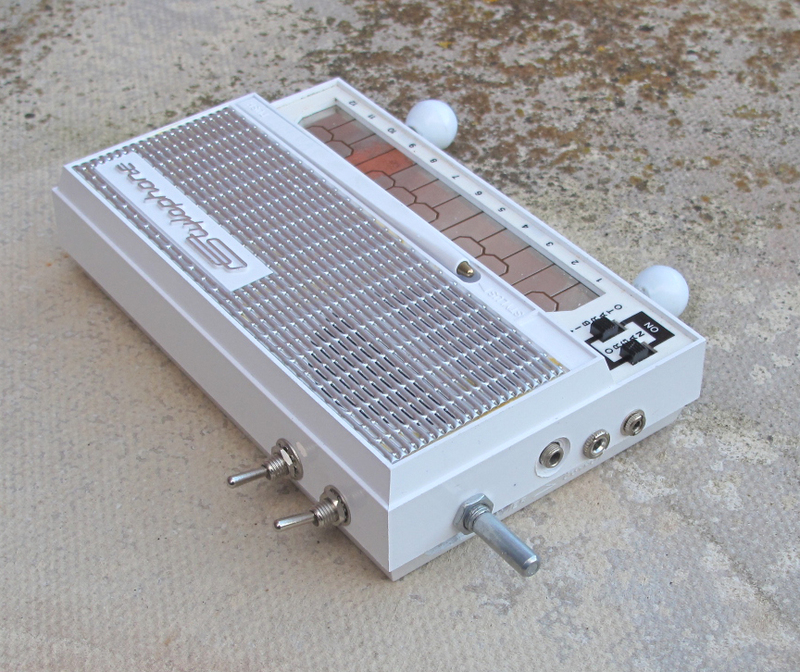 Ever since I found out about the ‘SoftPot’, I wanted to use one to control a stylophone. (This is one which still has its backing sheet. The SoftPot itself is transparent, and sticky on the back). The normal SoftPot value is 10k. When I looked at stylophone circuits, I realised that in most cases 10k isn’t going to do much. 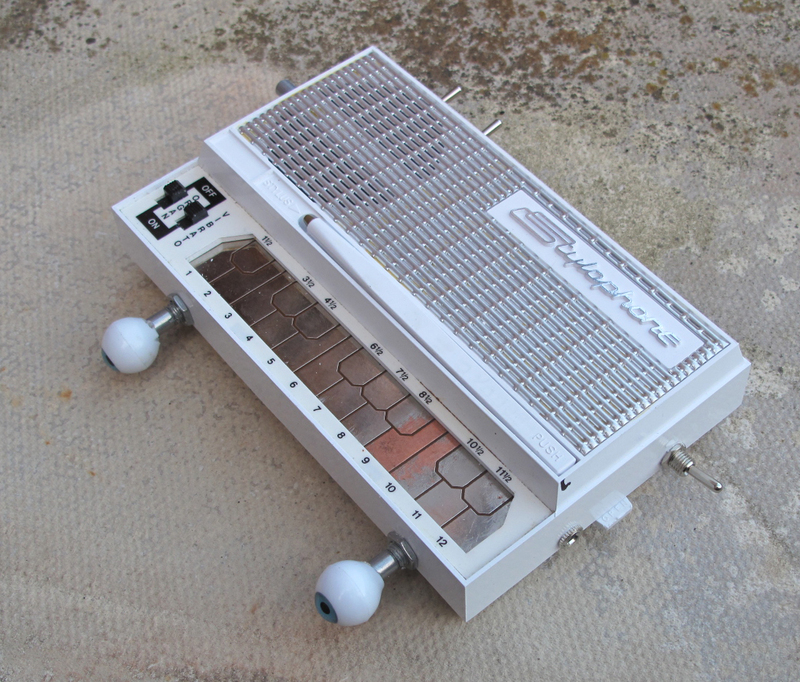 The pitch pot I added to The Alien – a modern reissue stylophone – was 2.2M, and although that amount of variation in pitch wouldn’t really be necessary, 10k would only represent a few notes. So I looked at one of the original 1970s stylophones, and saw more possibilities there, so I bought one from eBay with a slightly damaged keyboard. 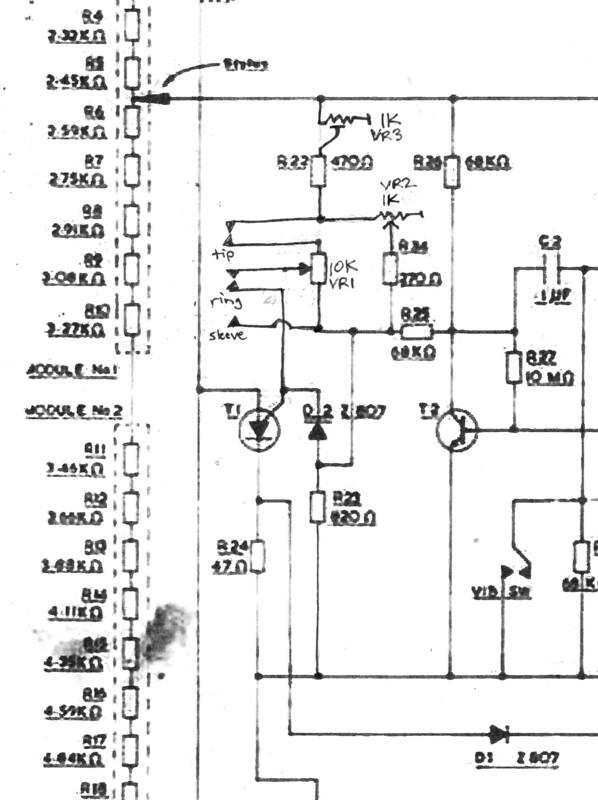 The values of the resistors are a bit blurry in this scan, but you can see that 10k isn’t going to affect the pitch very much if connected to the resistor ladder on the left – along most of the scale, this would represent only about 2 or 3 semitones. So I concentrated on the area where there is a tuning pot and a resistor to +v and resistor to ground. 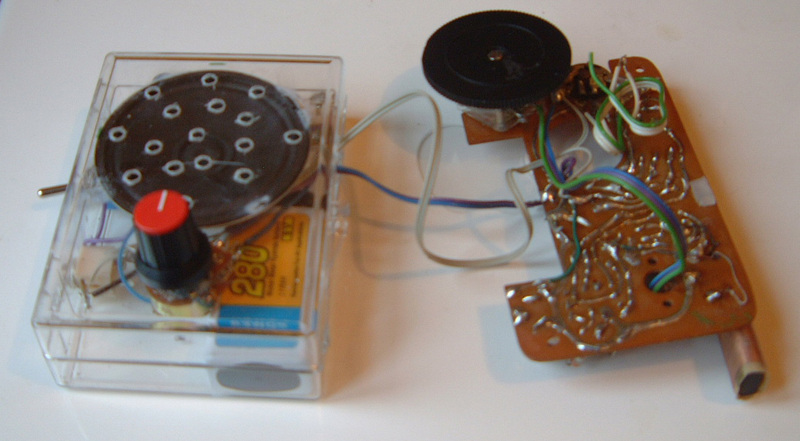 The tuning pot, which was 25k, allows the stylophone to be tuned, but doesn’t really cover more than about half an octave – still not enough to play tunes effectively. At first, I tried varying the 470Ω resistor to +V and the 820Ω resistor to ground, but to little effect: adding a 1k variable resistor to the +V end, in series with the 470Ω, and turning it down a bit did seem to help, but in the end the effect I wanted to achieve – a variation between top and bottom of a couple of octaves – was achieved first of all by reducing the tuning pot value to 10k, the magic number, the same value as the SoftPot. 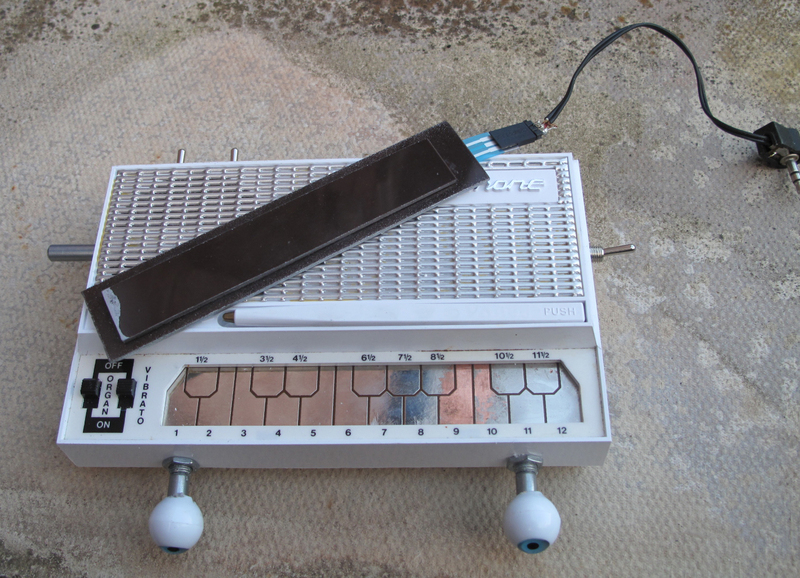 Secondly, the stylophone version I was working on had a resistor in parallel with the tuning pot – a very small one of about 270Ω. Replacing this with a resistance of 1k seemed to do the trick – and in fact I added a 1k potentiometer, as this would function as a narrow-to-wide control of the note range, in tandem with the 10k tuning pot. 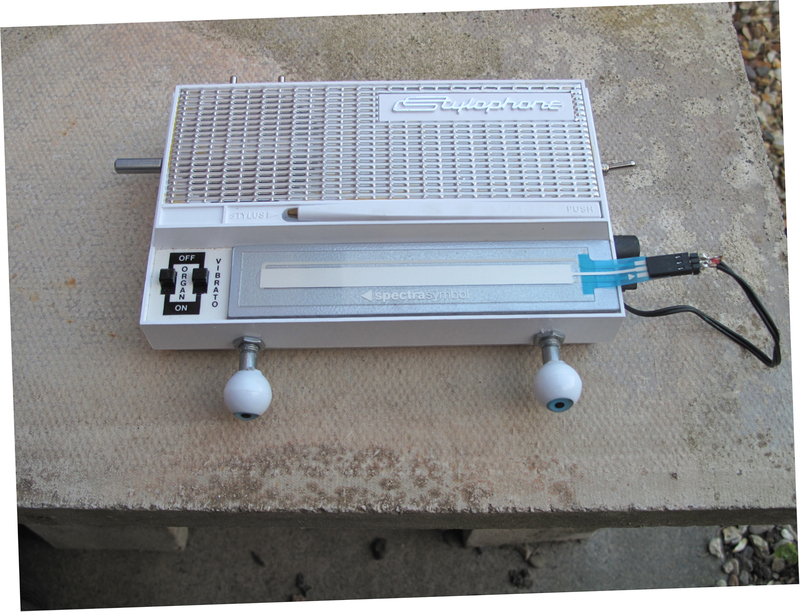 A 3.5mm stereo switched socket on the side of the stylophone would allow the stylophone to function normally, when required, but anything plugged into the socket would replace the tuning potentiometer in the circuit. This is how the SoftPot would be attached. The SoftPot, as previously mentioned, is sticky on the back, so was stuck to a piece of 2mm acrylic sheet cut to fit on top of the keyboard, just clear of the power and vibrato switches, and nestling inside the lip on the right hand side. Underneath this was stuck a smaller piece of 2mm acrylic which fitted inside the keyboard cut-out, and stopped the whole thing from moving as it was played. These three layers were stuck together, but weren’t stuck down to the keyboard. The soft pot terminals came attached to a 3 pin socket, the same size as the ones you get for PCB headers. I had some of these, so made up a lead with a 3.5mm stereo plug on one end, and a 3-pin PCB header plug on the other. The SoftPot assembly fitted in place, and was ready to go. All it needed was an actuator – like a pen, but with a rounded end. And, of course, the stylophone has one of these already: the stylus which gives it its name! 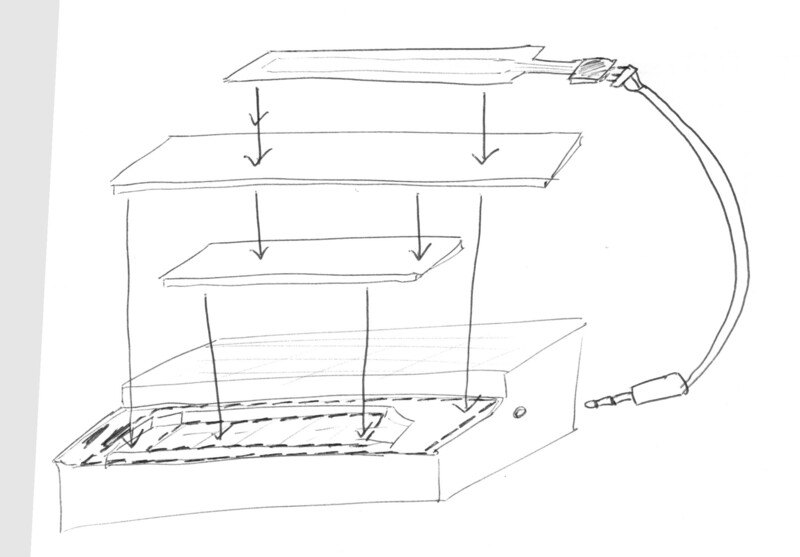 So the SoftPot Stylophone can still be played with the stylus in the traditional manner, but moving up and down the SoftPot, like a ribbon controller. There was just one more change to make to the circuit before this could happen. 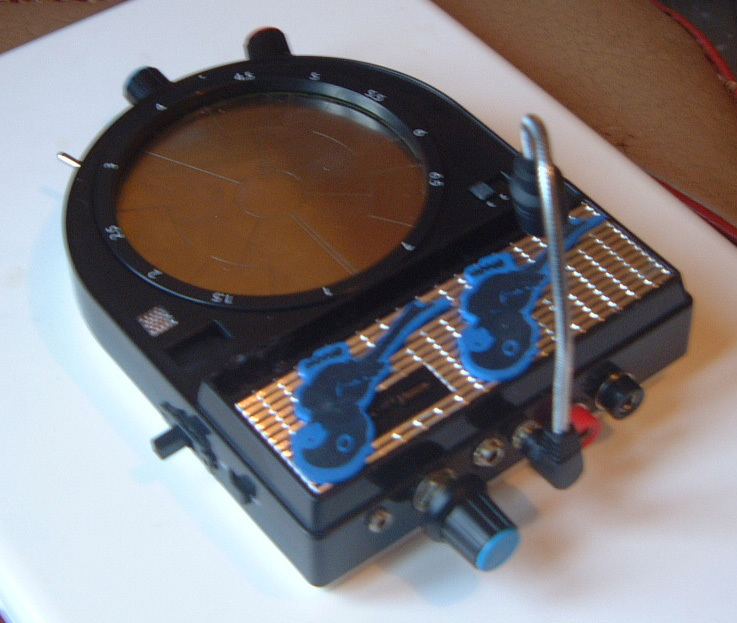 The Stylophone sounds when the +V in the stylus contacts a key, which is in turn connected somewhere within the resistor ladder. Now that the keys had been covered up, there would be no sound without a connection between the resistor ladder and +V – the stylus only pushes the SoftPot together, and the connection is made internally. As with The Alien and The Hedgehog, I simply made an internal connection between +V and one of the resistors in the ladder – the highest note – operated by closing a switch. Try as I might, I couldn’t arrive at a situation where the SoftPot Stylophone was silent until the Softpot was activated, but still gave a good note range. So I added a volume control – a feature which any stylophone would benefit from – and when you play, you can turn the volume down when not sounding a note with the SoftPot. Before finishing up, I added a socket to allow the SoftPot Stylophone to be operated from an external power source, a switch to cut out the internal speaker (this is not done automatically when the lineout socket is used), and a switch to cut out the low-pass filter in the line-out circuit. These original stylophones are famous for having a simple resistor-capacitor tone control on the line-out circuit which is not in the circuit to the internal speaker. This is the main reason why stylophones sound so different when the line-out socket is used. When you see pop musicians who use the stylophone at live gigs holding their instrument up to the vocal mic as they play, this is not mere theatricality: it is theatricality, of course, but it’s also the only way to get an unmodified stylophone to sound the same to a stadium or festival audience as it does to you when you play it ‘unplugged’ at home. Finally, I made a small modification for the benefit of a future project which I haven’t yet started on. I added another 3.5mm stereo socket configured in a similar way to the SoftPot input socket. In normal or SoftPot operation the resistor ladder is connected into the circuit; but anything plugged into this socket replaces the resistor ladder. The ‘Cracklephone’, nicknamed ‘The Blue Parrot’, is my second project recreating a classic design. The first, The Hedgehog, was a version of the famous Atari Punk Console; this one was my take on the ‘Cracklebox’ (or ‘Kraakdoos’ in the original Dutch). The original Dutch Cracklebox was created by Michel Waisvisz at STEIM (the Studio for Electro-Instrumental Music) in Amsterdam in the 1970’s. Waisvisz died in 2008, but his description of the Cracklebox can be found here: http://www.crackle.org/CrackleBox.htm. You can buy one like this from STEIM at http://www.steim.org/steim/cracklebox.php. 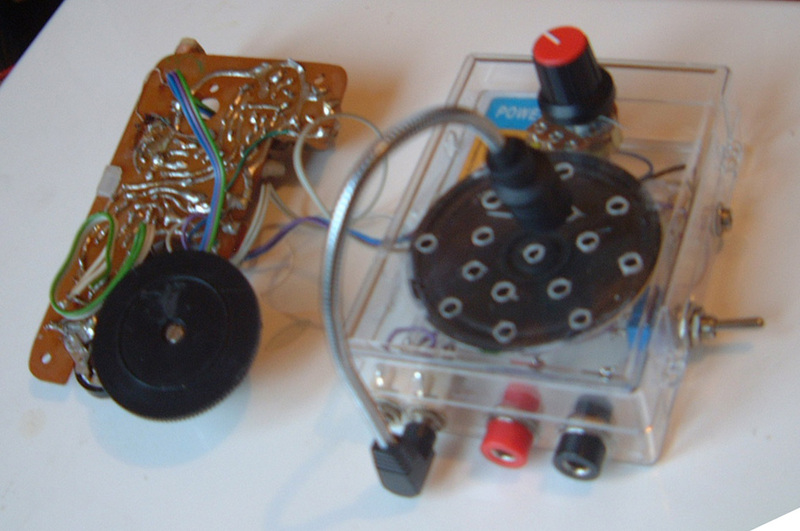 Waisvisz’s early experiments with electronic sound were of the type now known as ‘circuit-bending’, and the Cracklebox was developed as a natural extension of this: STEIM’s philosophy is very much in favour of low-tech electronic music-making and the ‘creative misuse’ of technology. In particular they emphasise the importance of human touch in musical performance. Accordingly, the Cracklebox is based on an early op-amp chip numbered 709 (LM709, MC709, uA709 or MC1709CG), provided with 6 pads or touch points which cause it to oscillate in a not entirely predictable way. The 709, as a matter of fact, was the first widely-used op-amp on a single chip. It was invented by legendary designer Bob Widlar – an ‘irrational, eccentric, and outspoken personality’, ‘alcoholic loner’ and ‘celebrated dropout’ according to his Wikipedia entry at http://en.wikipedia.org/wiki/Bob_Widlar. Whether or not STEIM knew of it, I don’t know, but I feel sure they would have approved of the physicality of his practice of ‘widlarising’ – ‘methodically destroying a faulty component or a flawed prototype with a sledgehammer’ . . .
Be that as it may, the 709, as a very early design in the field, required more external circuitry for ‘frequency compensation’ than later and more familiar op-amps like the ubiquitous 741, so lends itself to greater possibilities of interference by touch. 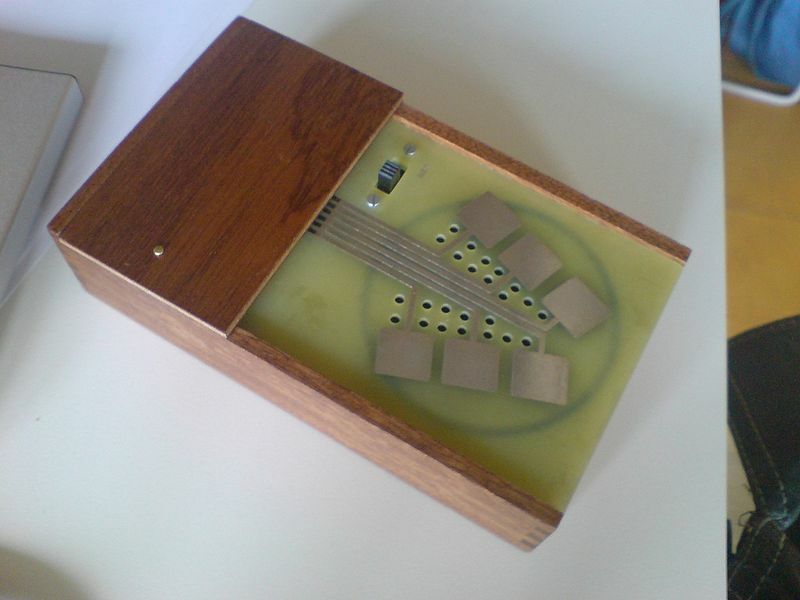 As people are different, so the Cracklebox sounds different when played by different people – the player and the electronics combine to make a unique instrument between them. (Indeed, it is possible for two or more people to play the Cracklebox at once, by touching separate pads, or each other. There are videos on YouTube demonstrating this). I had been using the computer a lot in recent projects, but the low-tech approach is another strand I’ve been following. Fortunately, circuit diagrams and advice on the Cracklebox were available at this website: http://www.eam.se/kraakdoos, and there was much discussion of it on the electro-music forum, for example: http://electro-music.com/forum/viewtopic.php?t=11052. In some places I read that the 709 could be difficult to get hold of, but I had no trouble in getting them from one of my regular sources, Cricklewood Electronics, at a perfectly reasonable cost. I have also read that the NTE909 works as well, but have not had cause to check this out. The reason why there are 13 touch points, rather than 6, is to do with the case I built it in. I mentioned in an earlier post that I had acquired a number of broken Stylophone Beatboxes. 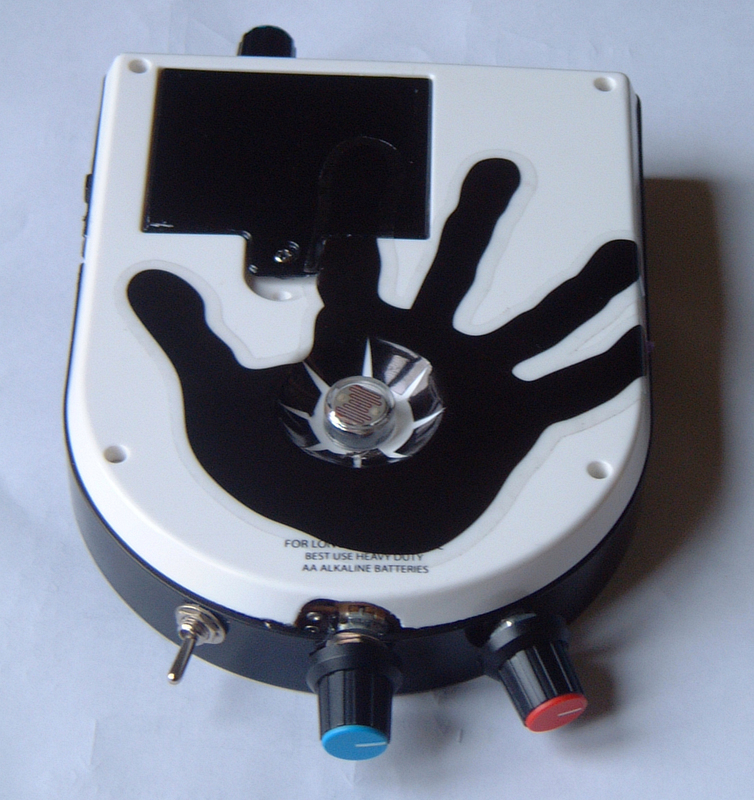 I had used one for the ‘Big Boy’ Stylophone mod, and had been looking for a project in which I could use another. 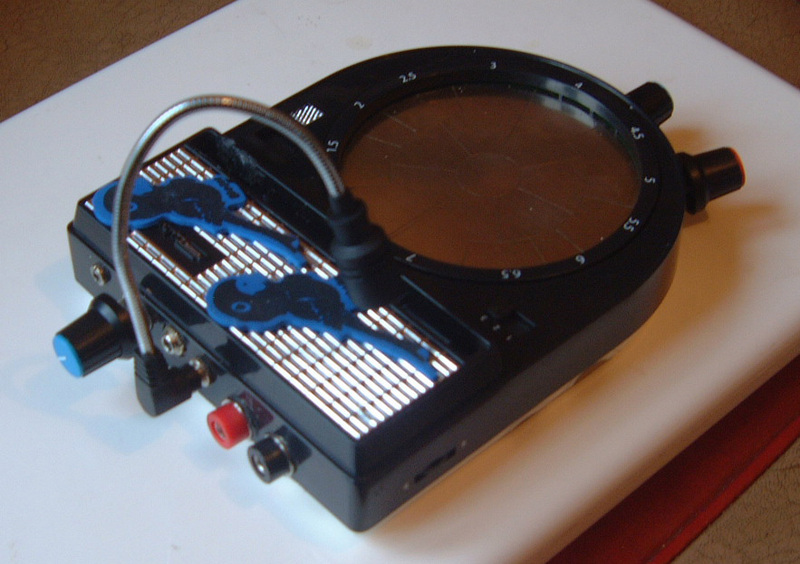 As the Beatbox has a large and attractive circular ‘keyboard’, divided into sections, I thought this would be ideal for a series of touch pads, as used in the Cracklebox. The Beatbox keyboard – or as it is now, ‘playing surface’ – has 13 segments, hence the duplication and addition of extra touch points. 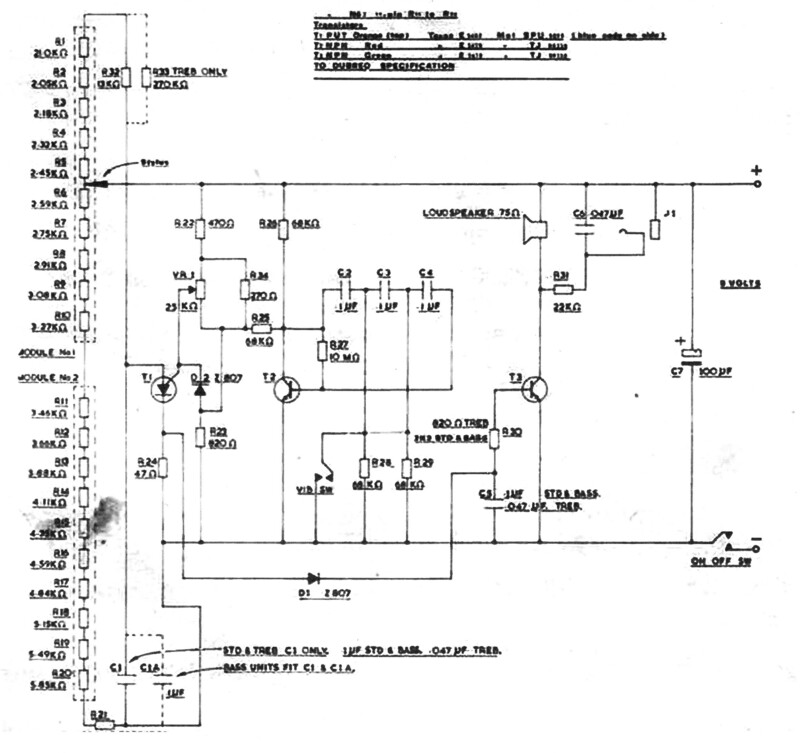 The original 6 are marked * on my circuit diagram. 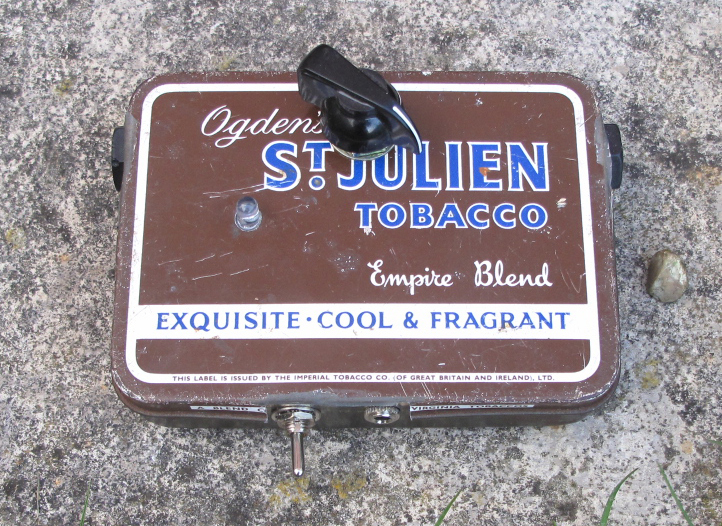 As many as possible of the Beatbox’s original switches were retained – mostly with different purposes, of course – and the volume control, in particular, proved useful to keep, as it could be manipulated with the right index finger while playing. 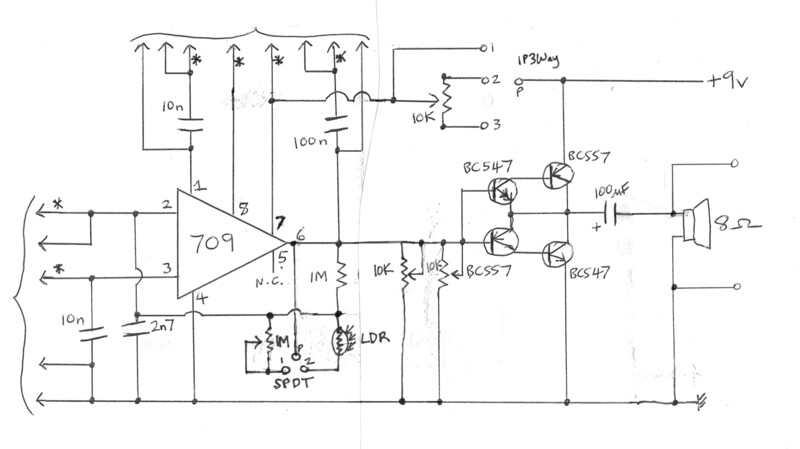 The odd arrangement in the middle of the circuit diagram is designed to make use of this – the first variable resistor sets an average, maximum or minimum volume, and is not much used when playing. – voltage starve. I added a switch to this arrangement, the idea being that the voltage starve could be applied or not, as required, and there is a choice of direction of turn of the control pot. After practising with it for a while, I prefer position 3, with voltage starve on, turning clockwise to increase voltage. – resistor bypass. There’s only one resistor in the circuit, so I added a 1M potentiometer in series with it, to increase or decrease the resistance between pins 2 and 6. I know that knob-twiddling isn’t entirely within the philosophy of the original Cracklebox, but I found it a useful addition, affecting the pitch of the sounds produced. – LDR. When I had finished, there was an unattractive hole remaining where the Beatbox tuning control used to be. I decided I needed to fill this in and calculated that an ORP12 LDR was the perfect size to do this. I put this in series with the 1M resistor, and added a switch so it could be selected in place of the 1M potentiometer. The effect it has varies considerably according to the ambient light level and the type of sounds being produced: sometimes it acts almost like an on/off switch, allowing for ‘gating’ effects. The op-amp section and the transistor section were built on two very small scraps of veroboard to make sure they could be fitted inside the case – there was very little room above the large keyboard PCB. There is an LED shown in some versions of the Cracklebox circuit diagram. I intended to incorporate this as shown, but I wired it as an on/off indicator at some point when I needed to know whether power was getting to some parts of the circuit and in the end I left it that way. In fact, the Beatbox keyboard turned out to be a very good playing surface, allowing for a certain amount of variation in the strength of touch and the possibility of sliding gradually from one touch point to another. There is much discussion at the links mentioned above about whether a direct output could – or indeed should – be included, and if so, how this could most effectively be done. As the principle behind the original Cracklebox was that it should be a ‘stand-alone’ device, I decided to deal with this issue by purchasing – for under £2 – a small goose-neck mic. This plugs into a 3.5mm socket on the rear of the Cracklephone, and is bent to point at the speaker; adjacent to this is an out socket going to the amp. These sockets aren’t connected to the rest of the electrics in the case, so this is just a simple way to mic the instrument up, enabling it to be amplified or recorded however or wherever it’s being held or moved. At the moment, I can only get this to work when plugged into my laptop, not through my general effects and amplification system – but I’m working on it. I also added two 4mm banana sockets so the instrument could be connected directly to a (better) external speaker. The external speaker arrangement is described in another post. The working title for the project was the ‘Cracklephone’, since it’s a combination of the Cracklebox and a Stylophone Beatbox. I liked the look of the blue parrot stickers, and it sounds very reminiscent of a parrot, so it acquired its nickname – also a reference to Sydney Greenstreet’s bar in Casablanca.